How many times do you input a code each day? We’ve all got PIN numbers for our bank accounts and passwords for our computers and we use them on a daily basis without even thinking about it. Now that keyless entry is becoming the modern choice for securing doors, cabinets and lockers, we need to be able to remember more code combinations than ever before. But how do you choose codes that are both secure and easy to remember? ‘1234’ is an obvious choice, but it’s also the first code an intruder will try! Digital mechanical door locks only allow each digit to be used once, so, for example, codes ‘1122’ or ‘8888’ can’t be used. This makes selecting a code for a mechanical door lock slightly more limiting than it is selecting one for a digital electronic door lock. With electronic push-button locks the number of possible code permutations available is over a million four-, five- or six-digit codes and you also have the ability to repeat numbers in a code. Word up. Create your access code from a four or six letter word that means something to you, e.g. your partner’s name. Look at your telephone keypad, and select the number buttons the letters are on. For example, the word ‘help’ would give you ‘4357’ and the word ‘secure’ would give you ‘732873’. Name the date. Use a significant date. Your birthday is probably used for another password, but you still have your spouse or children’s birthdays, or your anniversary etc. Phone a friend. Take your digits from a friend’s phone number. The two key benefits of this are: you have the number stored in your phone under your friend’s name so you won’t forget it, and the numbers will be totally random. For example, if your friend’s phone number was 01987 541 546, you could take the last four digits: ‘1546’. Make shapes. All our keypads have either two or three columns of buttons. If you have a three-column keypad, you can create a code by drawing an invisible shape or letter with the keys: so for example, ‘159357’ would create an ‘X’, ‘21478’ a ‘C’ and so on. If you have a two-column keypad, you could create a pattern like a square ‘3465’. Make it history. Important dates in history are a popular choice for many. While ‘1066’ and ‘1945’ may not be the most secure choice, you could use the date when your favourite film was released, or even the date when Maggie Thatcher was elected as our first female Prime Minister – it doesn’t matter, it’s your code and no one else has to know! If you have purchased a CL4000 or a CL5000 electronic lock then you’ll have the added protection of a ‘tamper time out’ feature. This temporarily shuts the lock down for a short period of time after three incorrect code attempts, which helps to frustrate the opportunist who might stand at a door tapping in multiple codes in the hope of getting lucky. To view our full range of digital mechanical and electronic keyless door and cabinet locks visit our website. For help with programming your code, please call our technical support team on 0800 393405 or visit our website where you can download all our programming guides. 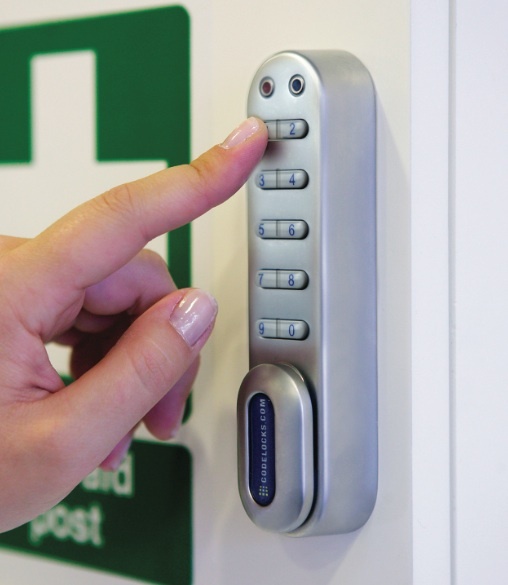 Go keyless with Codelocks, why use digital keypad locks?